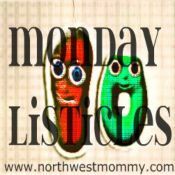 This week's Monday Listicles with Stasha at The Good Life is to share 10 Things You Thought as a Child You Would Do/Be. Mine are really pretty simple and stem from different phases in my childhood. 1. Be the cool little sister - although six years my senior, I wanted my brother's friends to be my friends. 2. Be a professional singer - truth is, I can barely carry a tune. But, on numerous occasions I recorded myself singing on cassette. I was so disappointed when I played it back. I still sometimes sing in the car, when it's just me, like I'm a super star. 3. Be a professional 4-wheeler rider (assuming there is such a thing) - I went up and down our driveway day after day pretending I was on a real road, driving with real drivers until one day I drove through a barbed wire fence. I put a pretty good cut in my nose and forehead. 4. Work the summers as a 4-H counselor - I went as a camper a few times and always hoped I'd get to serve as Counselor. We moved away before it could come to pass. 5. Be a strict and difficult teacher - I'd play school a lot when I was a child and my students (stuffed animals) were always getting into trouble and I was always having to be stern. I enjoyed being bossy! 6. Be just a tad skinnier - had I realized how "skinny" I was back then, I would totally embrace it with confidence instead of being insecure that I was a bit bigger than my friends. 7. Work in a library - I loved to read and I loved to go the library, so I felt it natural to want to touch and feel all of those books, organize them, and go through each and every one deciding whether or not it should be read. 8. Be a star basketball player - even though I loved to play basketball and was fairly good at it, I wasn't a "star." I was actually much better at volleyball. 9. Go to medical school to become a doctor - I did start out on the pre-med track my freshman year of college, but two chemistry's in and I felt the need to choose a different path. 10. Fall in love and get married - I've always been a romantic, hoping I'd be swept off my feet and that I'd do the same for someone else. I'm so thankful that God really did paint a beautiful fairy tale for me in this area. What were your desires/aspirations as a child? We had a few in common. I think after working shelving books at a library in high school, I realized how THRILLING it would be (not) & crossed that one off my list. Great list, 4H counselor, I didn't know such a thing existed. Glad you got your happily ever after. I have some old cassettes of me singing after watching The Mickey Mouse Club. I wanted to be a Mouseketeer. But I too, cannot carry a tune. I was so serious on those cassettes too. Embarrassing. I totally hear you on #6. I wish I had appreciated my physique when I was younger. What 18 year old me thought of as hideous 33 year old me would damn near kill for. Great post! I must be a book snob. While I have always been a friend of the library, I would have much rather worked in a book store. New book smell and feel is so much better. I always wanted an older sibling who would take me out for ice cream. Isn't that the only purpose of an older sibling? So happy you have your fairy tale!!!! When American Idol first aired, I was amazed by the number of people who had clearly never heard themselves sing. Or maybe their ears were broken? Who knows. Unfortunately enjoying something doesn't necessarily equate to being any good at it. There is absolutely something as a professional 4 wheeler rider! That's my favorite one. I may add that to the list for when I grow up. I'm going to ride in mud...and get dirty...yeah... I like where this is going. What does it say about me that I have no memory or wanting to be anything when I grew up? I know I played school. I know I played with Barbies. I know I rode bikes, and went swimming and did all the things kids do. But I have no memory of having a job aspiration. However, I have aspired to be skinnier all my life;) THAT I know for sure! Nice!! Very cool list. Glad your fairy tale came true!